"People are trying to use Bose-Einstein condensates to understand magnetism and superconductivity, as well as using them to make gyroscopes and atomic clocks," says Vladan Vuletić, the Lester Wolfe Professor of Physics at MIT. "Our technique could start to speed up all these inquiries." "A small fraction and a big drawback"
Scientists have conventionally created Bose-Einstein condensates through a combination of laser cooling and evaporative cooling. The process generally begins by shining laser beams from several directions on a cloud of atoms. The photons in the beam act as tiny ping pong balls, bouncing off much larger, basketball-sized atoms, and slowing them down a little in each collision. The laser's photons also act to compress the cloud of atoms, limiting their motion and cooling them in the process. But researchers have found there's a limit to how much a laser can cool atoms: The more dense a cloud becomes, the less room there is for photons to scatter; instead they start to generate heat. At this point in the process, scientists typically turn off the light and switch to evaporative cooling, which Vuletić describes as "like cooling a coffee cup—you just wait for the hottest atoms to escape." But this is a slow process that ultimately removes more than 99 percent of the original atoms in order to retain the atoms that are cold enough to turn into Bose-Einstein condensates. "In the end, you have to start with more than 1 million atoms to get a condensate consisting of only 10,000 atoms," Vuletić says. "That's a small fraction and a big drawback." 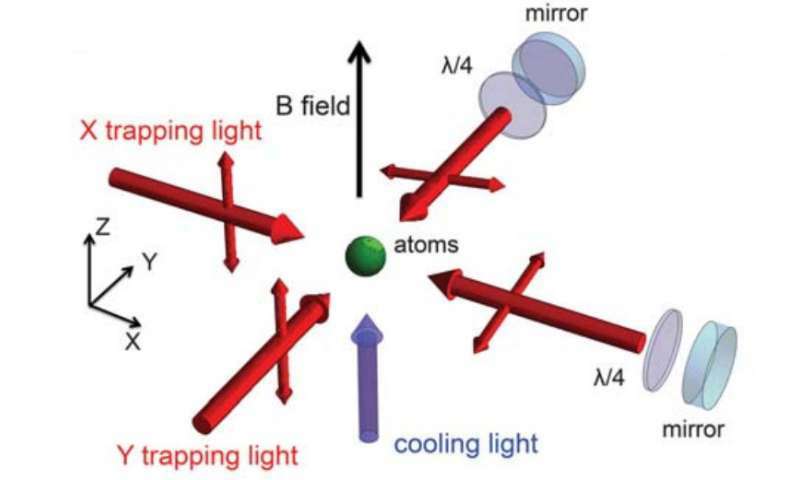 Vuletić and his colleagues found a way to get around the initial limitations of laser cooling, to cool atoms into condensates using laser light from start to finish—a much faster, atom-conserving approach that he describes as a "longstanding dream" among physicists in the field. "What we invented was a new twist on the method to make it work at high [atomic] densities," Vuletić says. They then switched over to a method known as Raman cooling, in which they used a set of two laser beams to cool the atoms further. They tuned the first beam so that its photons, when absorbed by atoms, turned the atoms' kinetic energy into magnetic energy. The atoms, in response, slowed down and cooled further, while still maintaining their original total energy. The team then aimed a second laser at the much-compressed cloud, which was tuned in such a way that the photons, when absorbed by the slower atoms, removed the atoms' total energy, cooling them even further. "Ultimately the photons take away the energy of the system in a two-step process," Vuletić says. "In one step, you remove kinetic energy, and in the second step, you remove the total energy and reduce the disorder, meaning you've cooled it." He explains that by removing the atoms' kinetic energy, one is essentially doing away with their random motions and transitioning the atoms into more of a uniform, quantum behavior resembling Bose-Einstein condensates. These condensates can ultimately take form when the atoms have lost their total energy and cooled sufficiently to reside in their lowest quantum states. "The atoms become almost transparent to the photons," Vuletić says. "Before, when a photon came in, it was scattered by, say, 10 atoms before it came out, so it made 10 atoms jitter," Vuletić says. "If you tune the laser away from resonance, now the photon has a good chance of escaping before hitting any other atom. And it turns out by increasing the laser power, you can bring back the original cooling rate." The team found that with their laser cooling technique, they were able to cool rubidium atoms from 200 microkelvin to 1 microkelvin in just 0.1 seconds, in a process that is 100 times faster than the conventional method. What's more, the group's final sample of Bose-Einstein condensates contained 1,400 atoms, from an original cloud of 2,000, conserving a much larger fraction of condensed atoms compared with existing methods. "When I was a graduate student, people had tried many different methods just using laser cooling, and it didn't work, and people gave up. It was a longstanding dream to make this process simpler, faster, more robust," Vuletić says. "So we're pretty excited to try our approach on new species of atoms, and we think we can get it to get it to make 1,000-times-larger condensates in the future."